The High Roller observation wheel is seen under construction in Las Vegas, Nevada September 9, 2013. 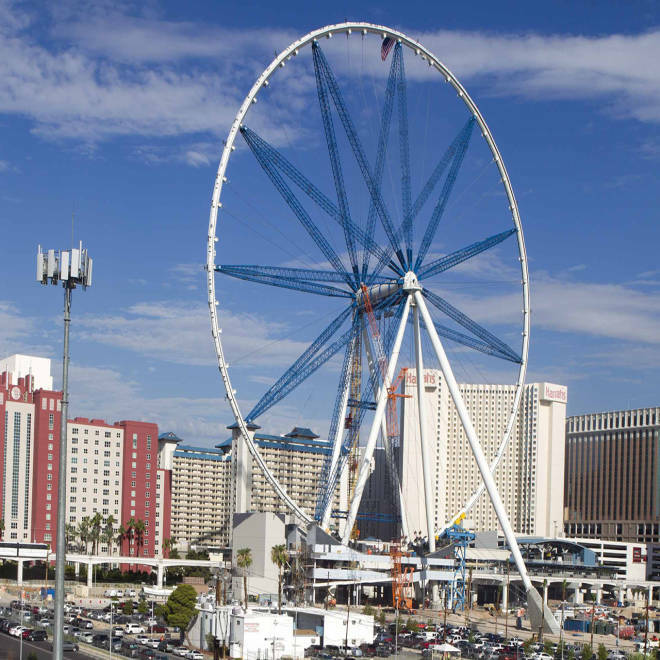 The outer shell of what will be the world’s largest Ferris wheel was erected Monday on the Las Vegas Strip, a locale already notorious for inducing sensory overload. The top of the High Roller ride, placed across the street from Caesar's Palace, will soar 55 stories over Sin City. When the new landmark is completed early next year, it will be adorned with 1,500 LED lights. "It's going to be an icon," Project Director David Codiga told The Associated Press. "It's going to be a part of your visit to Las Vegas if you ride it or not. It's more or less impossible not to see it if you come here." The Ferris wheel is part of a $550 million plan — including an outdoor plaza and mall — by Caesars Entertainment Corp. to lure more young people to Vegas. Each spin will cost tourists about $30, according to Caesars spokeswoman Christina Karas. The massive Ferris wheel will not be what people remember from carnivals of their childhoods. Pods designed to transport 40 people will come with audio-visual components to accompany aerial views of the city during the half-hour rotation. While the 550 foot ride will trump the current largest Ferris Wheel, the Singapore Flyer, by 9 feet, it may only hold the record for a short time. In 2012, New York City Mayor Bloomberg announced plans for a Staten Island Ferris wheel which, at 625 feet, would exceed the height of the Singapore Flyer, the London Eye and plans for the new wheel on the Las Vegas Strip. The plans just got community board approval earlier this summer. Codiga is not worried about the competition, he said, because only "the High Roller will allow you to float over Las Vegas."